Continuing the series of thoughts I learned from The Sensei on design issues, perhaps the most important is to turn off the computer. The rationale behind this is clear, the results are immediately observable and yet few people will follow this teaching. Computers we believe are designed to make life easier. The reality is that we change our lives to fit with computers. For a dramatic improvement in your p cubed value, turn off the computer. There is a moment in every presenter’s career when they realise that the quickest way to construct a presentation is to open a computer program and enter text directly into this. The presentation evolves, it is saved in one place and changes can be made quickly and easily. Practise from the same script every time and, as we are reading it out, it needs little embellishment. Turn off the computer. The reality is that this approach is like building a house without plans. It’s obvious what you need, it looks like every other house you have seen. Changes can be made, but never substantial and the result will be probably okay. If that is the aspiration of the presentation, it will probably be achieved. Turn off the computer. Creativity is what will change your audience, whether one is sharing a business plan or teaching on Hirschsprung Disease. The bare facts alone will hold little attention beyond five minutes; a textbook is always more engaging. To change the mind of an audience one needs to consider their needs, their purpose in being in the hall and their reason to listen to you rather than any other source of information. Creativity does not happen through a keyboard. 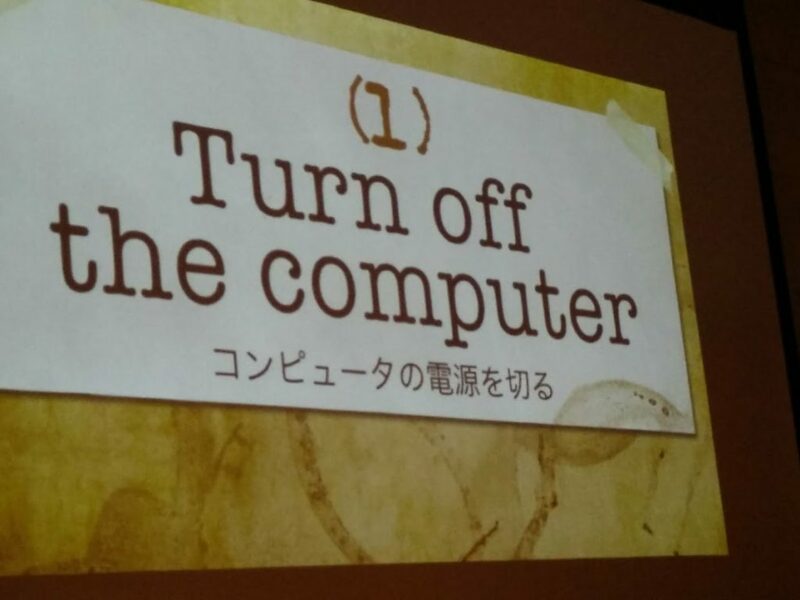 Turn off the computer. The value in planning analog (paper and pencil) is that it is slow, that it is messy, that it can be easily ripped up to start again. Rather than finding a way for the computer to store one’s ideas, simply write, draw, sketch, doodle, walk, talk, think or dream. Then try to capture that and start again. Each iteration will build through the last and lead to something of more value than the first thought. Turn off the computer and allow your brain some space. This takes time, but nothing good happens without time. The computer has its place but your brain works much better looking for ideas without the additional task of looking for letters on the keyboard. For a big change in your p cubed value, turn off the computer. It took me a long time to change my approach to presentations and do this but it does actually does make so much of a difference. Before it just flowed on to the screen, and other than moving a few slides around, what i started with was pretty but what I ended up with – Now when I start the end product is often very different from what I initially had in mind and hopefully the better for all the extra thought. Thanks both for your comments and encouragement for others. I’m glad to hear that the change is valuable for both presenter and audience alike. Followed this advice for presentation 2 weeks ago. Great reception and the execution of talk was much more enjoyable for me too. Thanks!